This comprehensive hands-on series of books examines every aspect of effective center management from A to Z. Offering the best advice and thinking from recognized experts on program administration, these books are designed to be comprehensive, hands-on training texts as well as ongoing reference tools for center administrators. The ideas presented are practical; the strategies are proven to work. A high quality curriculum is at the core of a high quality early childhood program. 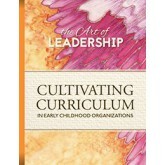 Cultivating Curriculum in Early Childhood Organizations provides practical, down-to-earth advice from leading experts on curriculum development. Content focuses on child development, curriculum principles, environmental design, and program evaluation. Professionals working in early childhood organizations need to continually improve their skills and broaden their perspectives. Developing People offers practical advice from leading experts in our field on selecting, training, and appraising staff, as well as promoting teamwork among staff members. High-quality early childhood programs are highly effective in engaging and supporting the families they serve. Engaging Families addresses the full spectrum of responsibilities in working with families: welcoming, supporting, engaging, and communicating with parents. 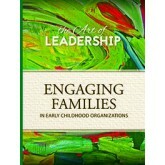 In addition, it provides helpful advice on working with all types of families in today's society. Leadership matters in early childhood. 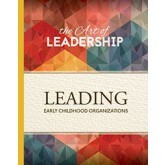 Leading Early Childhood Organizations provides you with practical advice from top experts on leadership in the early childhood arena. Content focuses on the skills required to lead an organization, supervise staff, and manage the organization. Administrators of early childhood programs must be as effective at managing financial matters as they are at caring for young children and their families. 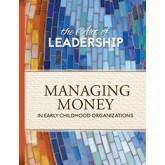 Managing Money in Early Childhood Organizations provides you with practical advice from top experts on every aspect of money management, including budgeting, fundraising, financial reporting, cash flow analysis, audits, salary schedules, fee policies, collection techniques, and more. Professionals working in early childhood organizations need to continually improve their skills and broaden their perspectives. Promoting Early Childhood Services offers practical advice from leading experts in our field on economics, advocating for children and families and promoting your program. 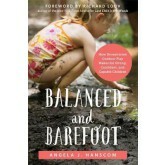 In this important book, a pediatric occupational therapist and founder of TimberNook shows how outdoor play and unstructured freedom of movement are vital for children s cognitive development and growth, and offers tons of fun, engaging activities to help ensure that kids grow into healthy, balanced, and resilient adults.Today s kids have adopted sedentary lifestyles filled with television, video games, and computer screens. But more and more, studies show that children need rough and tumble outdoor play in order to develop their sensory, motor, and executive functions. Disturbingly, a lack of movement has been shown to lead to a number of health and cognitive difficulties, such as attention deficit/hyperactivity disorder (ADHD), emotion regulation and sensory processing issues, and aggressiveness at school recess break. So, how can you ensure your child is fully engaging their body, mind, and all of their senses?Using the same philosophy that lies at the heart of her popular TimberNook program that nature is the ultimate sensory experience, and that psychological and physical health improves for children when they spend time outside on a regular basis author Angela Hanscom offers several activities to help your child thrive, even if you live in an urban environment.Today it is rare to find children rolling down hills, climbing trees, or spinning in circles just for fun. We ve taken away merry-go-rounds, shortened the length of swings, and done away with teeter-totters to keep children safe. Children have fewer opportunities for unstructured outdoor play than ever before, and recess times at school are shrinking due to demanding educational environments.With this book, you ll discover activities you can do anytime, anywhere to help your kids achieve the movement they need to be happy and healthy in mind, body, and spirit. Bringing the Outside In: Ideas for Creating Nature-Based Classroom Experiences for Young Children offers extraordinary nature-based experiences to encourage educators and young children to bring the natural world into the early childhood classroom. Each hands-on, open-ended, and sensory oriented experience is designed to spark discovery and imagination; encourage conversations and collaborations; allow young children to develop a sense of wonder and get to know the natural world inch-by-inch and bit-by-bit; and preserve the joys of childhood. Bringing the wonders of nature to children is truly a worthwhile journey. Building Together is a journey focused on the leadership necessary for today’s early childhood education system building. This book provides a road map to what effective leaders do, how they do it, and the leadership necessary to work towards collaborative systems level change. Building Together includes a wealth of information on the leadership skills, styles and competencies necessary to address today’s challenges and opportunities in the field of early childhood education. It also includes how to put leadership skills and knowledge into action to work towards sustainable system planning, implementation, and continuous improvement. 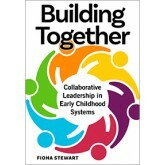 Author Fiona Stewart includes success stories throughout the book from professionals in the field as well as examples from her own leadership work. 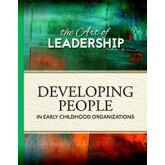 Today’s systems-level work requires sophisticated leadership skills. Building Together provides all the leadership information needed for both emerging and experienced leaders. Children deserve to spend their days in well-designed environments that support their needs and stimulate their learning. Adults who spend their days teaching and caring for young children deserve environments that maximize their skills. The newest revision of Caring Spaces, Learning Places is a book of ideas, observations, problems, solutions, examples, resources, photographs, and poetry. 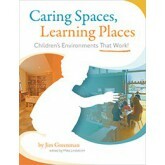 Here you will find current thinking about children's environments - 380 pages to challenge you, stimulate you, inspire you. EDITOR'S NOTE: Jim Greenman was a designer, philosopher, and provocateur, but he was first and foremost a teacher. His teachings and insights live on through his writing, and while I was stunned at how up-to-date and pertinent Caring Spaces remains, I shouldn't have been. After all, I use things that Jim taught me every day. To say that the editing team had a light touch with this 3rd edition of Caring Spaces would be an understatement. Jim's words stand the test of time incredibly well, and this new edition leaves his sometimes quirky and always insightful prose intact. We have worked hard to include updated references, a new appendices section, and to refine the layout and graphics in ways that make the book more readable, but the ideas, anecdotes, strategies, and innate "rightness" of the book we left alone. My hope is that Caring Spaces inspires a new generation of educators and designers to realize Jim's vision of spaces for children where wonder, beauty, sensory richness, and functionality are the norm and not the exception. 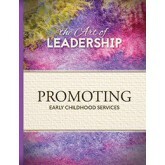 The updated and expanded edition of an early childhood favorite! You likely have dreams for your early childhood environment that are greater than rating scales, regulations, and room arrangements. 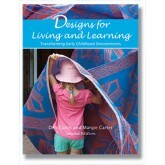 Designs for Living and Learning has been a favorite resource among educators and caregivers for more than a decade, and this new edition is packed with even more ideas that can be used as you create captivating environments that nurture children, families, and staff while supporting children's learning. 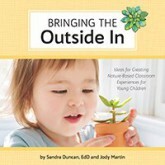 With hundreds of all-new colorful photographs of real early learning settings and a multitude of simple and practical concepts for creative indoor and outdoor spaces and learning materials, this book truly is a source of inspiration as you learn how to shape welcoming spaces where children can learn and grow. 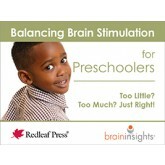 Expanded chapters include new information reflecting current trends and concerns in early childhood, such as the use of repurposed and nontraditional materials, children in the outdoors, alternative ways to think about providing for learning outcomes, facing and overcoming barriers and negotiating change, and the impact of environmental rating scales in Quality Rating and Improvement Systems (QRIS). Two new chapters are included, one highlighting the transformations of environments with before and after photos and outlines of the process, and the other with examples of soliciting children's ideas about the environment. Age focus: 3-5. Softbound, 360 pgs. 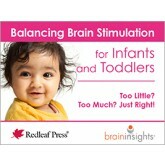 Deb Curtis and Margie Carter are internationally acclaimed experts in early childhood and coauthors of many books. Attention seeking is seen as misbehavior in young children, and giving them the attention they need is often times interpreted as reinforcement of bad behavior. 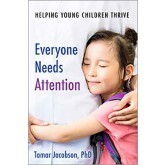 Everyone Needs Attention focuses on how we, as adults, manage our emotions when children seek our attention, including a how-to chapter to help the reader reflect about how they sought out attention as children. 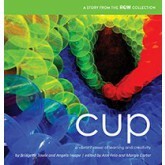 This book includes conversations with teachers as well as some concrete steps to assist in self-explorations. Tamar Jacobson, PhD, includes her own life story, as well as anecdotes of her work with teachers, families, and children over the past forty years as a preschool teacher, professor, mother, and early childhood consultant.